Electric vehicles are becoming more commonplace, thankfully, but they are still not the most affordable vehicles on the market today. Sure, they might save you money in the long run—and perhaps some peace of mind, if you are the eco-conscious type—but they can cost a pretty penny up front. And, of course, if you want a luxury vehicle—or one that is uniquely innovative—then you have probably been eyeing a Tesla Motors electric vehicle for some time now. Of course, Tesla is top-of-the-line; and while you get what you pay for, it will definitely cost you. Your kids, however, they could drive a Tesla, probably, at a far more reasonable price. No, not in ten years when the market can bear more competition; your kids can drive little Tesla replicas, today. 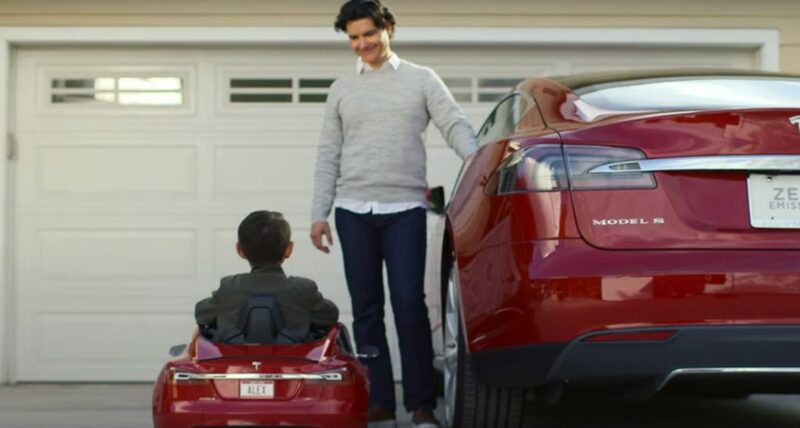 Tesla Motors has teamed up with the incomparable Radio Flyer to develop a kids Tesla Model S replica which looks exactly like the full-sized Tesla Model S Sedan. And right now, it is available on preorder for $499, with a full launch in May, just in time for summer. The Tesla Model S (for kids) is recommended for children between the ages of 3 and 8. it comes complete with working headlights and, just like its big boy predecessor, a lithium ion battery. Radio Flyer proudly explains that this provides more hours of play time than any of the competing toys on the market. In addition, the Tesla Model S (for kids) is available in color options also very similar to the real Model S. This includes: Red Multi-coat, Midnight Silver Metallic, and Deep Blue Metallic. The charming little roadster—or sidewalk-ster—can reach impressive speeds of up to six miles per hour but parents can adjust the limit to three miles per hour, via safety switch. The miniature car even has a front trunk for storing toys (you know, for those long kiddie road trips) and even a sound system which can be plugged into any mobile device. Apparently, though, Tesla Motors (and Radio Flyer, by association) is/are not the only one(s) putting out a luxury toy car for kids. Actev Motors has released an electric Arrow Smart-kart which looks just like a race car, complete with two independent motors for improving and braking, for $599. Also, Mercedes-Benz has released a $525 replica with functioning headlights and two driving speeds.